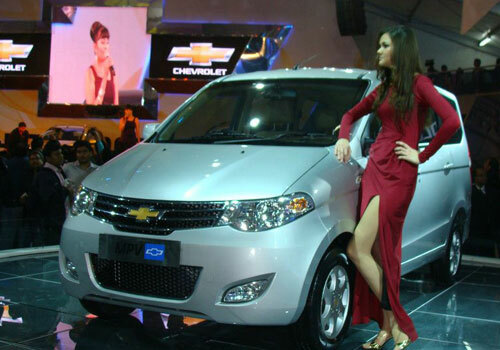 Chevrolet is all set to launch a brand new product in Indian auto market christened, Chevrolet Enjoy MPV. The MPV was also displayed at the Auto Expo 2012 earlier in the month of January. We bring to you some fresh details on the Chevrolet Enjoy MPV that is slated to be launched by the end of this year. Enjoy will be an eight seater MPV which is based on the Chinese Wuling CN-100. The MPV will be offered in two engine options, one will be the 1.4 litre petrol mill and another one will be the 1.3 litre Fiat Multijet diesel powertrain. Chevrolet Enjoy MPV is expected to be launched with a price tag of Rs 6.5 lakhs. The 1.4 liter VGIS engine will come with 1399 cc displacement that can pump out maximum power of 94.6 Bhp and a peak torque of 127 NM mated to a five speed manual transmission gear box. The MPV will be equipped with features like power steering. The petrol engine would apparently offer a decent mileage of 12kmpl on city roads and 16 kmpl on highways. Expected to be priced aggressively at Rs 6.5 lakh, the MPV will lock horns with Maruti Ertiga MPV launched less than a month in the domestic market. The company has safely guarded details about the diesel variant, for latest news and updates on the Chevrolet Enjoy MPV watch this space and keep yourself updated on that.